MINI ENCYCLOPEDIA - EARTH is the mini book crammed with masses of knowledge about our precious planet Earth for kids aged 8+. Children can learn about all aspects of Earth with over 10 different topics Awesome photographs on every page help children experience the wonders of planet Earth Did you know? fact panels highlight extra interesting information to make learning fun. This amazing encyclopedia for kids is small enough to slot into school bags, making this a fantastic resource for school projects and homework at key stage 2. 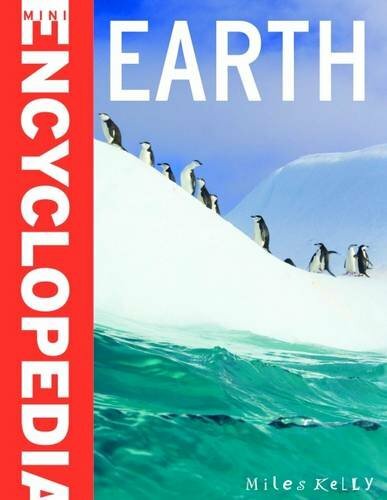 The ultimate Earth book for kids, Mini Encyclopedia Earth is a compact, comprehensive children's encyclopedia that uses clear, bulleted facts and incredible info panels to explain everything from the formation of Earth and Earth s great landscapes to climate change and renewable energy. Every topic is supported by photographs, realistic artwork and detailed diagrams, and color-coded sections make navigation through the topics easy and quick. Chapters and topic examples of Mini Encyclopedia Earth: Earth in space and time: Formation of the Earth, Earth in space, Earth and Moon, Ice ages and Fossils Structure of the Earth: Minerals, Rocks, Earth s core, Continental drift and Tectonic plates Volcanoes and earthquakes: Types of volcano, Volcanic eruptions, Earthquake damage, Famous earthquakes and Tsunamis Shaping the land: Weathering, Caves, Waterfalls, Floods and Deserts Continents and oceans: Major islands, World Ocean , Beaches and Coral reefs, and Icebergs Mountains and canyons: Himalayas, Andes, European Alps, Mid-Atlantic Ridge and the Grand Canyon Great rivers and lakes: Amazon, Nile, Congo, Ganges and Lake Victoria Atmosphere and weather: Air moisture, Air pressure, Seasons, Climate zones and Weather forecasting Exploiting Earth: Metals and minerals, Gems and jewels, fossil fuels, renewable energy and farming the land Living Earth: Ecosystems, Tropical forests, Polar and mountain life, Grasslands and Deep sea life Earth in danger: Global warming, Climate Change, Pollution, Threatened species and Conservation Amazing facts for kids to learn include: The place on Earth farthest from the ocean is in Xinjiang Province, northwest China, at more than 2500 km from an oceanic coastline. The Persian Gulf is the warmest sea in the world whilst the Red Sea is the saltiest sea. A tropical rainforest may contain 1000 different species of plants and animals in a tennis-court-sized areas.